It’s not often you can get better than 2-to-1 odds fading a team that is 5-12 in their last 17 games and has lost the last five times with their scheduled starting pitcher while backing a pitcher who has a career 0.57 ERA versus that team. 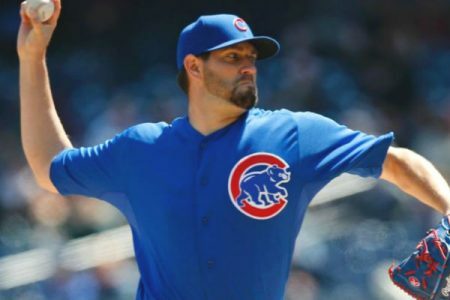 But that’s the case with the Braves against the Cubs and 33-year-old Jason Hammel, who surrendered 10 runs and five homers in four plus innings during his last start this past Friday. Hammel is 2-5 career-wise versus the Braves in 10 starts with a 5.77 ERA. Hammel is the weakest of the Cubs’ five main starting pitchers. Of course the reason for such a high price is Atlanta, the worst team in the majors. The Braves aren’t playing well either having lost four in a row, including just having gotten swept three games on the road by the Phillies. The Braves have scored the fewest runs, own the lowest batting average and also rank last in homers. They are pitching unheralded Lucas Harrell. Hence, the big lay price on the Cubs. Harrell will be making his second start for the Braves. His first outing was highly successful – a 9-1 win over the Marlins and Jose Fernandez this past Saturday at home. Harrell allowed just one run on three hits in six innings with one walk and five strikeouts. That was his first big-league start in two years. Harrell has experience pitching at Wrigley Field when he pitched for the Astros. He’s made two starts there and holds an 0.57 ERA and a 2-0 record in four appearances versus the Cubs.The Cubs sure can’t be too excited about this game. It was supposed to be a day off for the Cubs today, but this is a makeup game. The Cubs have a bigger series looming Friday-Sunday when they play the Pirates in Pittsburgh. This also marks the Cubs’ 21st straight day of playing. Chicago is 1-6 in its last seven games so fatigue may be taking a toll so close to next week’s All-Star break. I know the Braves are a tough sell even at a nice value price like this. But I sure wouldn’t be laying this kind of price on the Cubs right now, especially in this game.